Just Who Was The Real St. Nicholas? People around the world are celebrating Christmas - and perhaps enjoying a few gifts from Santa Claus. But many don't realize Saint Nicholas was a real guy. 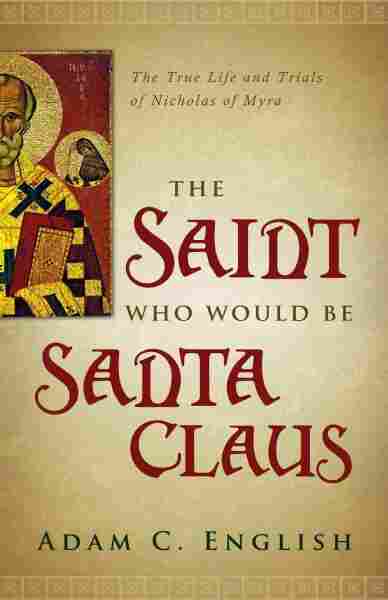 Guest host Celeste Headlee talks with Adam English, author of The Saint Who Would Be Santa Claus, about the real Saint Nicholas. Just Who Was The Real St. Nicholas? He has a lot of names, including Santa Claus, Kris Kringle, Sinterklaas, Noel Baba, Popo Gigio — and of course — St. Nicholas. But believe it or not, St. Nicholas was a real man. He was a bishop, living in the 3rd century, in what's now modern-day Turkey. St. Nicholas oversaw a massive transition in the Christian faith, including participating in the Council of Nicaea — the first ecumenical council. Legend has it that he slapped a famous heretic with his sandal. English says the story isn't true, but his bones show that he had a broken nose. "So perhaps he did have a violent past, or perhaps he did get into a scuffle or two in his lifetime," English tells NPR's Celeste Headlee. But there was one true story that somehow captured the imagination of Christians for centuries. By the twelfth century, English says, nuns in France were making little gifts, leaving them on the doorsteps of children, and signing them "from St. Nicholas." None of this, however, was actually connected to Christmas or Christ's birth. St. Nicholas Day is celebrated on December 6th. English says that Santa Claus was initially introduced into the American context in the early 19th century. It was a combination of the day's proximity to Christmas, and an effort by prominent New Yorkers to reclaim their European heritage. "They were looking for roots, they were looking for traditions," English says. "They turn to their Dutch heritage, and to be Dutch is to celebrate Sinterklass — celebrate St. Nicholas." Today's image of Santa Claus is very different than that of the original St. Nicholas of Myra. English says he loves the stories of the jolly old man, with rosy cheeks, and a hearty laugh. But he wants to challenge Americans to consider the true story behind St. Nicholas. "To not only give gifts to our family, those that we love and those that we know," says English, "but to reach out beyond our family walls to those who we don't know, who we don't love, and to include them as well."